So you want to commission a handmade instrument? Iʼve had two mandolins made for me. One by Phil Davidson a round hole Brazilian style flat top bandolim, and recently one by Paul Shippey a f hole carved top A5 style. Two very different mandolins in style and sound. It was fun working with both luthiers. They each had their own ways of working and both were extremely helpful and keen to make me the instrument I wanted. For those of you who are thinking about having an instrument made or just curious about the process I thought it would be fun to share my experiences, the things I had to think about and the stages of the building process. Having an instrument made by a professional luthier is a big step to take and a big investment. Itʼs also a step into the unknown and a leap of faith. When you buy an instrument in a shop you can try it out and decide if it has the right sound, the right feel and quality that you are looking for. You pay your money and take it home. Having one made means you have to be very certain what you want and be able to communicate that to the luthier you have chosen. So why have one made? There could be many reasons like the prestige of owning a hand built instrument or knowing your instrument will be unique or maybe you had played someone elseʼs handmade instrument, liked it and wanted one for yourself. In my case it was because I couldnʼt find an instrument in the shops that fulfilled all my criteria. Make sure you do your research. Most luthiers have a web site, visit their stands at festivals or try their instruments in music shops. Keep listening until you find one that inspires you. Choose a maker because you like the instruments they make for quality, looks and sound. Although you can ask a luthier to make your idea of a whacky design, if you ask them to do something they havenʼt done before then they have to start from scratch with new moulds and templates. It can cost a lot more and it might not meet your expectations. Many makers will not have a lot of stock for you to try as their instruments are often sold as soon as they are finished. So find someone who has one of their instruments and ask them if you can try it. One plus for me in choosing Paul was that he is player himself. It is not essential but as a player he was able to interpret what I was looking for and was able to demonstrate through playing the differences between instruments. It takes a while to make an instrument so its important you strike up a good relationship as you will be communicating with each other at each stage of the build. good sound, a deep, sound, a bright sound, will only be according to their ears and what they individually like to hear. So you must have a clear idea of the sound you want. A good way to explain this is through recordings or borrowing a mandolin to play to your chosen maker that is close to the sound you want. With Phil I played him recordings, showed him photos of Brazilian instruments and said “Thatʼs what they sound like, this is what they look like, can you make me one?” With Paul I wanted an instrument almost the opposite in sound to the Davidson. It was more difficult to describe and went something like..”The honey sound of my Gibson A1 with depth and volume and a clear and even response across all strings and the fingerboard…an instrument that will sound good for jazz and blues but that I could use for classical..” No pressure then? NOTE: Even though you may think you know what you want remember the Luthier is the expert who has years of experience and knowledge. Listen to their advice and be guided by it. They know what they are doing and will build you a very fine instrument. The following are the things you will need to be certain of or at least have thought about before talking to a luthier. The sound – e.g bright, silky, smooth, woody, deep, loud. The sound may depend on the type of music you are to play on it. A big bluegrass sound with a hard chop feel, a versatile classical sound, a bright brazilian sound or a woody blues sound. If you are a bluegrass player you will probably want an F5 style because that is what nearly all bluegrass players think they need to be credible. Folk players tend to lean to towards flat top mandolins while classical players will be looking for a traditional bowl back or the more modern carved back and flat top combinations. Fret Board Scale length – distance between frets. Early mandolins had shorter scale lengths than say the modern bluegrass mandolins. This is quite a consideration particularly if you intend to play classical or early mandolin music or indeed if you have small hands or short fingers. There are some classical pieces that are almost impossible to play on a modern longer scale length because of the cross string stretches involved. Try different scale length mandolins before you decide. Mike Vanden makes a long scale length model after a mandolin he made for Simon Mayor. Simon wanted more room between frets at the top of the fingerboard to make access to the higher registers easier. Traditionally mandolins have been made with flat fingerboards like classical guitars. However concert model bowl backs like the Embergher mandolin were made with a radiused fretboard very like the curve on a violin fingerboard. You can now find most styles of mandolin available with both flat and radius fretboards. The choice is simply a matter of personal preference. Itʼs worth trying both, to discover if you have a preference. It will be important to know as it makes a difference to the nut and bridge construction and is slightly more time consuming to build. You must also consider how many frets you want as some players find the full length concert F5 fingerboards modeled on classical concert bowl back mandolins get in the way as they extend over the plectrum playing area. Unless you play very advanced classical pieces you will not need to go beyond 22 frets. Its worth having the top D though to accommodate the many pieces written for mandolin in D minor. Mandolins are usually made from woods that give good tonal response. The body is often made from a hard wood like mahogany, maple, or rosewood and the top is usually made from Spruce because is has a long straight grain. On quality mandolins the fretboard is made from ebony. The choice of wood will often depend on the sound you want. Some woods will change over time giving a richer tone as the wood ages while, with others, the sound you get to start with is the way it will stay. The choice of wood will affect the look of the mandolin. The final colour is governed by the wood itself but also by the the stain you choose for either a light honey, a dark mahogany colour or even a sunburst effect. Discuss colours before the final finish is applied. If you are spending on a hand built instrument ask the luthier about the choice of machine heads. S/he will probably have their own preference but Paul found some very light machine heads for mine. They are very accurate, they stay in tune and they look fantastic being in black. Quality makes include Gotoh and Schaller. Traditionally f style mandolins use adjustable bridges and flat top or folk mandolins have fixed fitted bridges. The bridge can have a significant impact on the sound. It is the means by which the sound is transmitted from the strings to the instrument body. The thinking behind adjustable bridges is that the action can be raised or lowered easily. You might want to do this for better ease of playing or for changes in action as a result of atmospherics. Classical string players have a different bridge for winter and summer as their instrument expands or contracts slightly with heat. When I asked for a fixed bridge Paul and I were really impressed with the better sound quality on the A5 compared to an adjustable bridge. This is personal choice but worth thinking about. The width, depth, taper and shape of mandolin necks vary a lot. I have a Gibson A1 which has a flat fingerboard short scale length and very distinctive V profile shaped neck. Some mandolins have an almost parallel fingerboard and neck while others taper getting wider from nut to the mandolin body. Some have slim necks like guitars while others are more chunky. Neck size and shape can help or hinder your playing. The great mandolinist Radim Zenkl prefers a very wide neck while bluegrass F5 style instruments as played by David Grisman have a narrow neck. Discover which suits your playing style and the size of your hands and fingers. If you intend to amplify your mandolin then you will need to consider having a pick up built into the mandolin. It is easier to do this while it is being made than to fit one later. There are many options including pickups requiring phantom power. They are usually fitted inside the mandolin or built into the bridge. I have tried both contact pickups and bridge pickups and without a doubt the bridge pickup gives a superior rendition of the acoustic sound and in my experience no feedback. Ask your luthier about options and do some research online. The other option of course is to amplify using a microphone but I suggest you buy a good quality instrument microphone that you know does your instrument credit and carry it with you at all times. If you use a strap you will also need a strap button unless you use a piece of string round the machine heads. This can be fitted retrospectively but worth discussing position and aesthetics for comfort and looks. Some luthiers will provide a case or find one for you. Its worth buying a good case to protect your new instrument having made such a big investment. Carlton Cases will make custom interior fittings to match your mandolin exactly. The Kingham Case Co. also make custom cases but you can pay between £200 – £400 for a custom case. If you intend to put your instrument on an aircraft hold a strong case is essential. Depending on the style of mandolin and the maker expect to pay between £1,500 to £6,000 or more. Costs tend to increase with the reputation of the maker. You may have to wait some time for your instrument to be made. Waiting times can be from 1 to 2 years. Most Luthiers will have a waiting list and from the time it is started can take 6 to 9 months to complete. Most luthiers have a set design they use for each model they make. Inlays are used for fretboard dots, hole surounds and often the makers name on the headstock. If you want more than the design offered, for example your name inlaid the length of the fingerboard you will pay extra for the inlay design, the intricate work involved and the materials. These are usually Abelone , Mother of Pearl, Shell Laminate or plastic ivory substitutes. Decoration adds nothing to the sound, more to the looks according to your taste and a lot to your pocket. 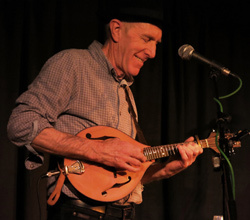 Dave Griffiths is a Musician, Mandolin Teacher, Arranger and Composer. He is a renowned blues, choro and jazz mandolin player and a respected mandolin teacher and workshop leader. Find out about his performance projects including Duo Recado with guitarist Helen James, his quartet Brejeiro and his live and recorded work with veteran singer songwriter Jim Reynolds.